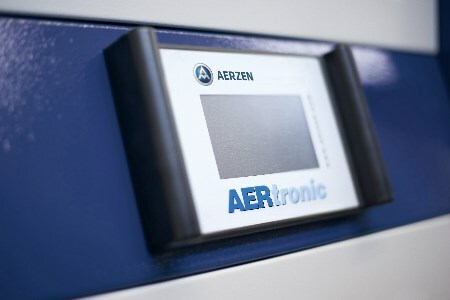 By means of its communicative control system, AERtronic, AERZEN has been offering the possibility to integrate process air packages into the production interfaces of customers for a long time. Furthermore, the control system can be extended by the module WebView so that operating or service data are retrievable at any time and from any point of the world. Warning or error messages of the blowers or compressors are transferred immediately by email to the relevant sections. Potential malfunctions can be detected early enough to initiate countermeasures promptly. A big step in direction of lasting process reliability. Present production systems or production processes always go along with structures and automation concepts that are more sophisticated and more complex. Malfunctions or even failures of compressed air systems can often entail high follow-up costs in this range. Standstill should be recognised, if possible, as soon as possible that action can be taken to avoid unexpected breakdown. In view of the future industrial revision industry 4.0 the current customer expectations principally rise in the range of process monitoring. AERZEN customers can retrieve operating data and service information of their process air packages via HTML5-enabled web browser using the solution ‘WebView’ of the system AERtronic. No additional software or apps are necessary. An intuitive operating concept, as well as a user-friendly interface, quickly provide information about the most important measured values of packaged units, such as pressure, temperature and parameters for operating and maintenance intervals. The measured values can optionally also be evaluated in graphic form for freely configurable periods of time. Apart from that, all process data are safely stored on a SD card integrated in the webserver module. Then, these data can be specifically retrieved; they can be read-out by customers via intranet or internet and be locally evaluated. Only after explicit release by customer, AERZEN service technicians can, of course, become active by means of this read-out file and can assist with troubleshooting. If required, signal messages can also be sent to the requested recipient, freely selectable as alarm or error message. In principle, customers receive a remote access to all data that are available in the AERZEN control system. This also includes data concerning vibration analysis, oil levels or system pressure of customers - if included in the scope of supply as an option. If service and maintenance are prematurely planned, operational interruptions can be reduced significantly. This is no problem thanks to AERtronic, since due notice is given about necessary service via the WebView. In future, also spare parts can be inquired or ordered with AERZEN fast and simple at the touch of a button. Certainly, the WebView is designed in a way that retrofitting of existing systems with AERtronic is realisable cost-effectively at any time. To communicate with other systems or control rooms AERtronic can now revert to a new interface - the PROFINET by Siemens. The succession interface of PROFIBUS represents a new ethernet-based standard for the automation.